Collected ourselves, from a local farmers’ co-operative, a fresh and colourful range greets you as you approach the entrance to our farm shop. 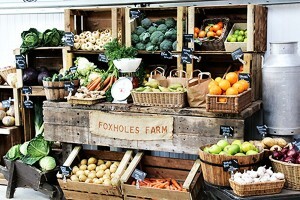 Local fruit, vegetables, root vegetables, potatoes and salad produce…always local wherever possible. Do you have some recipe ideas? Do send us your own recipes for us to share with other customers. This fresh produce is complemented by top quality ready prepared and frozen vegetables and fruit, for when you find time is at a premium.